The real Stephen Colbert is about to stand up. Colbert doesn't want to reveal too much ahead of his Tuesday premiere on CBS, but the new host of "The Late Show" says he's ready to put his curiosity about the world on full display. During Colbert's only national TV interview ahead of the premiere, CBS's Mo Rocca asked him to define the goal for the show. "The goal is to have fun with my friends," Colbert said. "And that means sometimes talking about things that you care about. We're going to want to be talking about what's going on in the world." Colbert did that on Comedy Central for almost a decade, but as a fictional character mimicking conservative commentators like Bill O'Reilly. Now, with the mask removed, "you can be more transparently curious," Rocca suggested. "That's a great word," Colbert said. "I want to be publicly curious." If his Comedy Central character was a pompous know-it-all, Colbert's style on CBS will be tell-me-all. His initial guests will include Vice President Joe Biden, Jeb Bush, Elon Musk, Amy Schumer, and Supreme Court justice Stephen Breyer. In an interview with GQ magazine earlier this summer, Colbert said that keeping the "Late Show" name is "kind of crazy," given David Letterman's enormous legacy, but changing the name would have been unrealistic and perhaps disrespectful to Letterman. 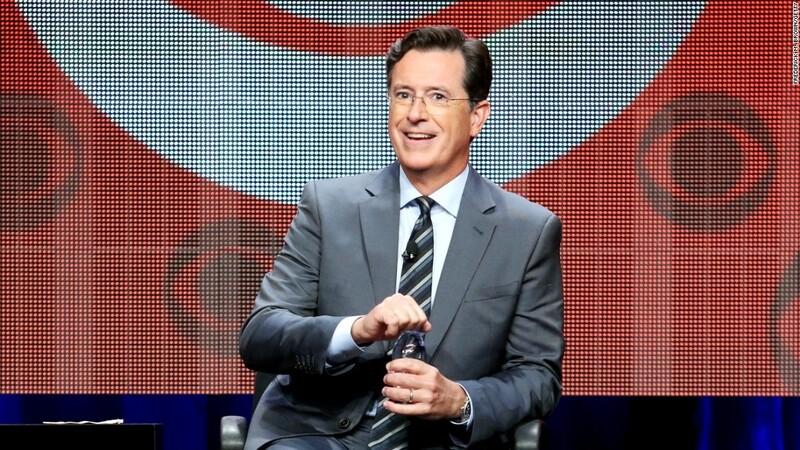 Colbert also commented, "I'm replacing two shows -- Dave's show and my old show." His conversation with Rocca aired on "CBS Sunday Morning." Colbert said of his old Comedy Central character, "I guess, flattering that people thought I was an actual pundit or a newsman, eventually, over the years. But it's really nice not to have to pretend it anymore." On the other hand, he said he hopes viewers "find out pretty quickly that the guy they saw for 10 years was my sense of humor the whole time." Colbert's past will even be reflected in a few of the pieces of the set, which includes a Captain America shield and a book shelf from "The Colbert Report." Colbert told The New York Times in an interview published Sunday that he knew well before his Comedy Central contract expired that he'd be leaving that perch. "I had to change, for my own growth," he said. Walking onto the theater stage with Rocca, Colbert said, "I started out as an actor. I thought, 'I wonder if I'll ever make it to Broadway.' Well, I made it! Uh, through a fairly circuitous route. But I made it."